Aston Service Dorset and the Forshaw family have been our clients for decades. Over the years we have exclusively manufactured many Aston Martin body parts in small batches or individually that they then sell all around the world. Aston Service Dorset have the manufacturing and distribution rights for all Aston Martin cars from 1948 to 1963 and also the David Brown Lagonda’s, they also supply spare parts for all Aston Martin’s and Lagonda’s up to and including the DB7 Vantage and Vanquish S.
We predominately make body parts for the DB2 Aston Martin cars, now include the front grille. If you’re interested in purchasing any of these Aston parts you’ll need to buy directly through Aston Service Dorset. To order or make an enquiry directly with Aston Service Dorset please click any of the ‘Order or Enquire’ buttons you’ll see across our site, and we’ll send them your message – we’re told discount bundles can be had! Parts we currently produce are the DB2, DB2/4 MK1 & MK2 Front Grille, DB2 Lightweight Grille, DB2/4 MK3 Front Grille, DB2 Rear Light Plinths, DB2 Front Wing Mouldings, DB2/4 MK1 and MK3 Bumper Sets, Aston Martin Copper Water Pipe Assembly Units, DB4 & DB5 Internal Roof Trim and now DB2/4 Radiator Fan Cowling, DB2 & DB2/4 Front Number Plate Box and the DB2 & DB2/4 Central Bonnet Moulding. 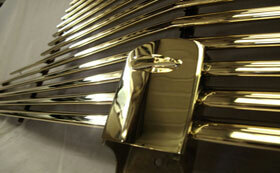 All parts have been manufactured using the original Aston Martin drawings from Aston Service Dorset.